December 4, 2018 - Carolyn appears with writer/actor Albert Howell (The Tonight Show with Jimmy Fallon; This Hour Has 22 Minutes; Harold & Kumar Go to White Castle) on his podcast "Albert's Nightmare". Carolyn was asked to choose 4 scenes from a movie script (unknown to Albert), and to read her part of the scene while Albert improvised the other lines. Listen to the podcast here. November 17, 2018 - Carolyn is interviewed on ANEW Dawn Podcast by host Dawn Piercy (Indianapolis, Indiana). Access her exclusive interview here. You may also listen to her interview on Spotify, PlayerFM, SoundCloud, or watch it on YouTube. October 1, 2018 - Carolyn is interviewed on Agree or Disagree: The Podcast by host Kevin Olenick (Vancouver, BC, Canada). Listen to her full interview in iTunes or on Spreaker. 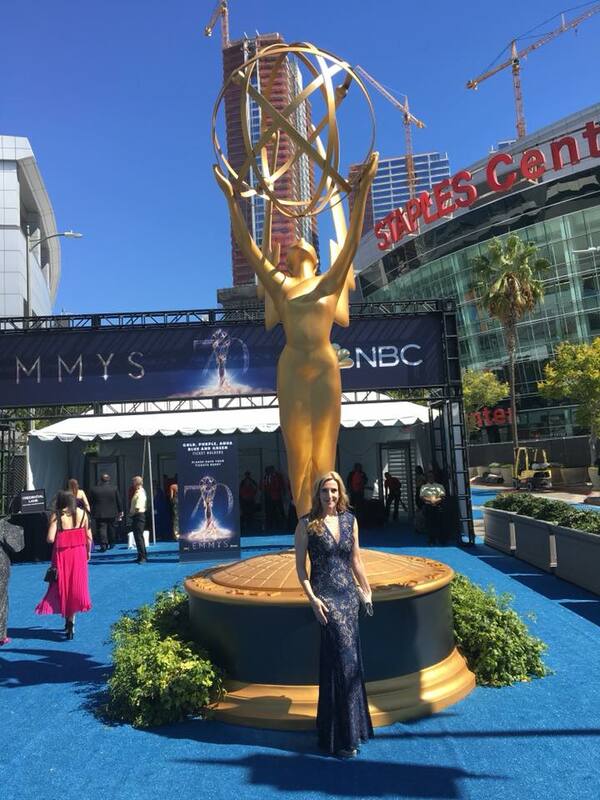 September 17, 2018 - Carolyn attends the 70th Primetime Emmy Awards in Los Angeles, California. July 1, 2018 - Carolyn is featured on the cover of the July issue of TZ Element Magazine, available in print and online. 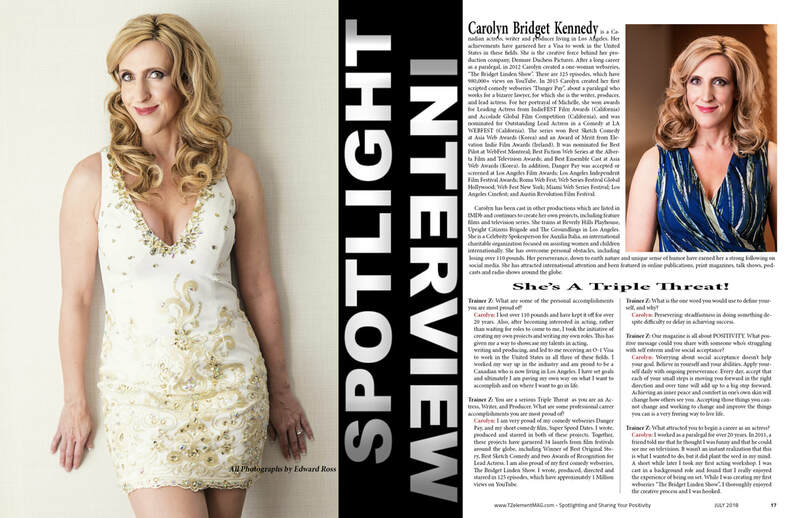 Read her full Spotlight Interview entitled "Carolyn Bridget Kennedy - She's a Triple Threat" here. June 13, 2018 - Carolyn arrives on the red carpet at the Women In Film 2018 Crystal + Lucy Awards in Los Angeles (Source: Frazer Harrison/Getty Images North America). March 23, 2018 - Carolyn is interviewed by Jason Down on the AME Radio Show in Florida. Listen to her interview here. 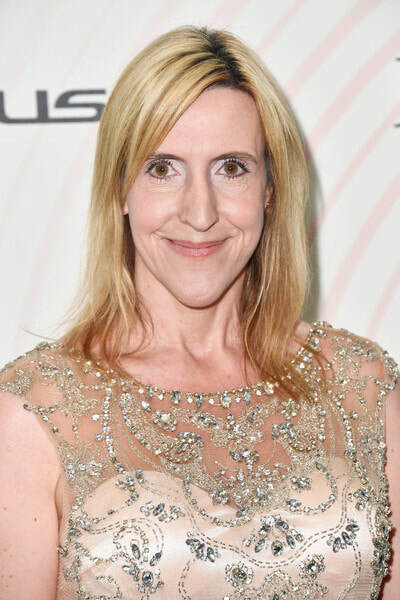 February 21, 2018 - Blasting News reviews Carolyn's first short comedy film "Super Speed Dates", which she wrote, produced and starred in. Read the review and an exclusive interview with Carolyn here. March 2, 2018 - Carolyn returns for a second interview with Extra Features Podcast in Toronto, this time to chat about her first short comedy film "Super Speed Dates", which she wrote, produced and starred in. Listen to her interview here. 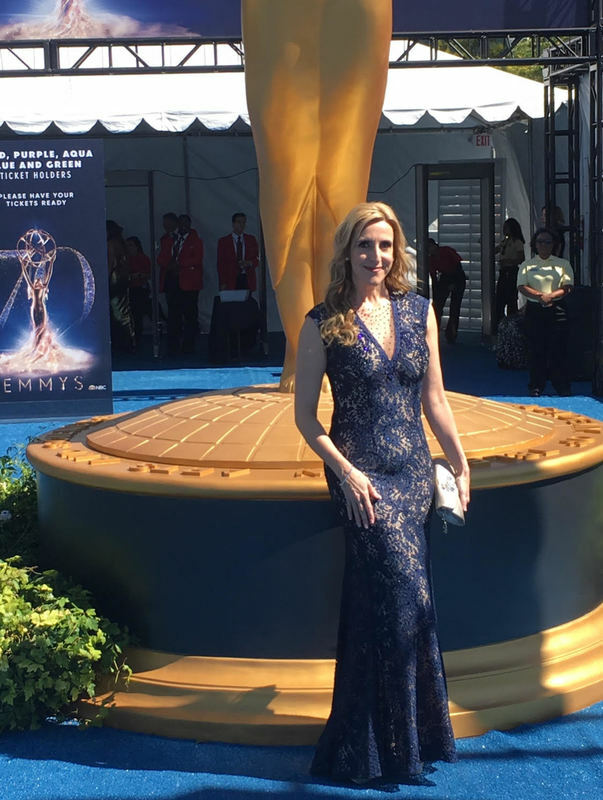 February 6, 2018 - Read Hollywood North Magazine's Exclusive Interview with Carolyn entitled "Carolyn Bridget Kennedy Makes Opportunity Knock". February 4, 2018 - Carolyn is interviewed by Sam Arcand for Edmonton Film Group Podcast on YouTube. Watch her full interview here. January 31, 2018 - Read Ruth Hill's most recent interview of Carolyn, followed by a review of Carolyn's first short comedy film "Super Speed Dates". January 31, 2018 - Women in Film & Television Vancouver shares the news about Carolyn's Short Comedy Film "Super Speed Dates" set to release after successful festival circuit run. January 25, 2018 - Read Occhi Magazine's article covering the online release of Carolyn's first short comedy film "Super Speed Dates" following a successful festival run. 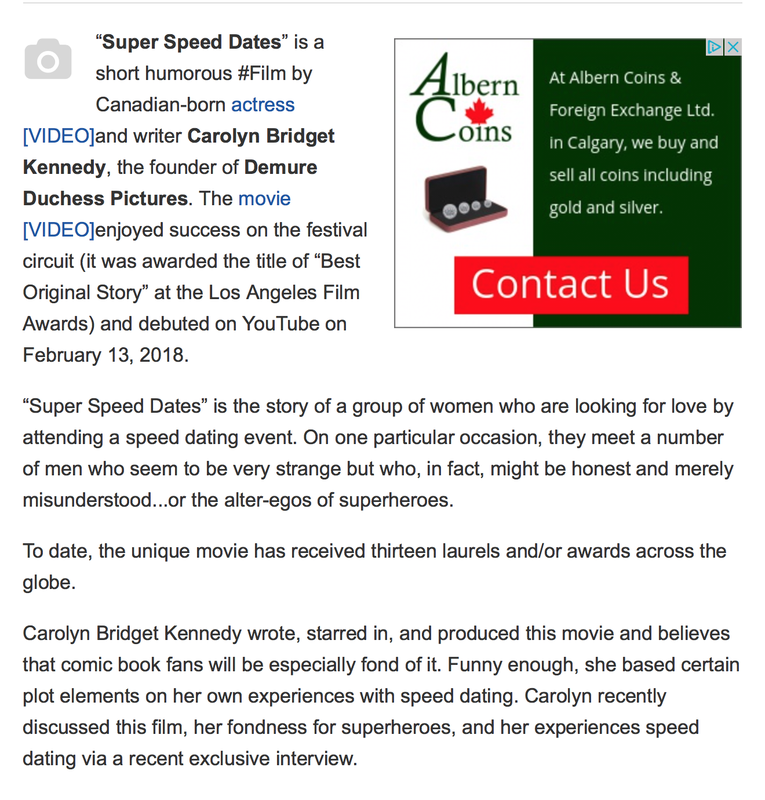 January 25, 2018 - EBoss Canada writes about the release of Carolyn's short comedy film "Super Speed Dates" after its successful run at film festivals. Read the full article here. January 25, 2018 - Read Indie Activity's article covering the wide release of Carolyn's first short comedy film "Super Speed Dates" following successful festival circuit run. ©2014 by Carolyn Bridget Kennedy, All Rights Reserved.